As rumors swirl over a possible, if not likely, Donald Trump Jr. indictment, many questions still surround the actions by the president’s eldest son, which may lead to his future legal troubles. Will Mueller indict Don Jr., or pass the task off to another jurisdiction like the Southern District of New York or New York State? Is there enough evidence to warrant an indictment? Are prosecutors holding off in an effort to avoid the President’s likely pardon of his son? This would, by far, be the most serious allegation, and this is in Mueller’s realm. Did Don Jr. actually have a part in a conspiracy with Russia to help his father win the 2016 election? The meeting went on, and it turned out that Natalia Veselnitskaya was advocating against the Magnitsky act. This act imposed heavy sanctions on Russian officials. On the surface, the Trump Tower meeting appears as if its purpose was to set up a quid pro quo — The Russians get reduced sanctions and the Trump campaign gets dirt on Hillary Clinton. This meeting, however, appears to be just the tip of the Russian iceberg. TheMoscowProject.org has tracked a total of 102 contacts between the Trump campaign/transition team and individuals linked to the Russian government. This includes a total of 28 different meetings. If Mueller finds that there was a conspiracy to work with Russia to undermine the democratic vote, because of the scope and scale of the possible conspiracy, multiple members of the Trump team may very well be charged with violating the Racketeer Influenced and Corrupt Organizations Act (RICO). Now what’s so important with racketeering cases is that basically every person involved in the conspiracy would be legally culpable for every crime the criminal organization committed. This is basically how prosecutors bring the mob down, and would be potentially devastating to all those charged. Another MAJOR point which doesn’t look good for Don Jr. and his father’s culpability is the fact that a criminal conspiracy only needs to be planned and not carried out in order to be considered a crime. So even if Don Jr. and others within the campaign were conspiring with Russia to commit crimes, which they never ended up committing, they could still be on the hook from a legal standpoint. Multiple violations of 52 USC §30121 – Contributions and donations by foreign nationals and the solicitation of a foreigner for such illicit campaign help. This statute can be violated even if the promised or requested help is never actually provided. If they tried to obtain it, this would be illegal. Now, even if Mueller finds that Don Jr. is really just an idiot who had no clue what he was doing, and there was no criminal intent or clear actions on his part or the campaign’s part, it does appear as if he lied to Congress multiple times, meaning he likely violated 18 USC §1001 multiple times. Back in Sept of 2017, Don Jr. told the Senate Judiciary committee that neither he nor the campaign had been offered assistance by foreign governments or nationals, nor did he seek such assistance. That’s not the only lie though. During the same hearing, Don Jr. also told Congress that he was only “peripherally aware” of talks to build a Trump Tower in Moscow during the campaign. But sources close to the deal claim that Don Jr. was briefed regularly about the Moscow project from Michael Cohen. Away from the Mueller probe, Don Jr. appears to be a co-conspirator in crimes which have already been uncovered. Michael Cohen has pleaded guilty to campaign finance violations, which he says were directed by the President. Donald Trump Jr. signed at least one check to Daniels in this criminal conspiracy. Don Jr. could also very well be charged in the conspiracy with his father and Cohen related to ‘Unlawful corporate contributions’ to a campaign. While we do know that New York State is investigating the Trump Foundation for fraud and other crimes, we do not yet know Don Jr.’s criminal culpability in all of it. Donald Trump Jr., as well as his brother Eric and sister Ivanka, were all on the board of the foundation, possibly placing any criminal liability of the foundation on their shoulders. While it’s impossible to tell how any indictments may play out, or when they are coming, Donald Trump Jr. appears to have quite a complicated legal battle ahead of him. 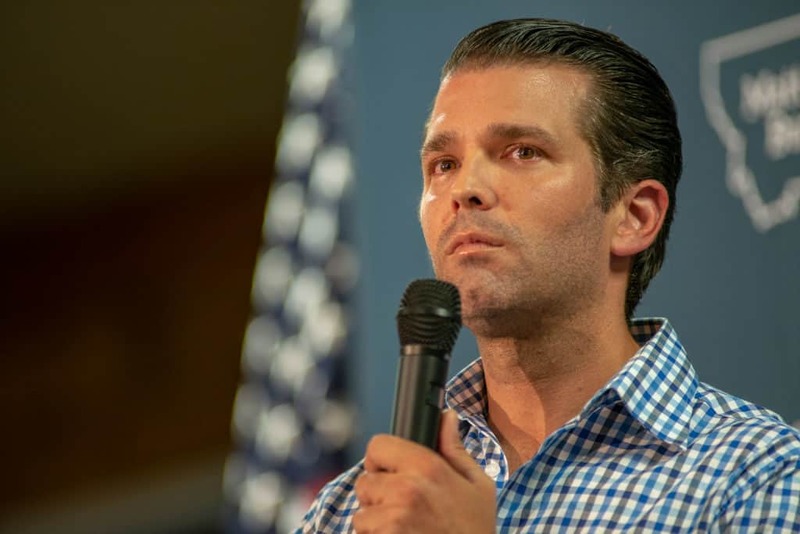 In Episode 9 of KrassenCast, we detail the possible criminal culpability of Donald Trump Jr. Episode 9 of KrassenCast is now available on iTunes, Youtube. and Google Play.